طلایی, فرهاد, پورسعید, فرزانه. (1392). بررسی تأثیر متقابل حقوق بشر و صلح بر یکدیگر. دوفصلنامه حقوق بشر, 08(1), 85-122. فرهاد طلایی; فرزانه پورسعید. "بررسی تأثیر متقابل حقوق بشر و صلح بر یکدیگر". دوفصلنامه حقوق بشر, 08, 1, 1392, 85-122. طلایی, فرهاد, پورسعید, فرزانه. (1392). 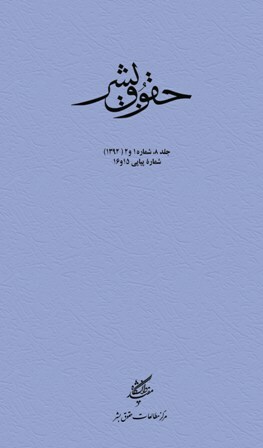 'بررسی تأثیر متقابل حقوق بشر و صلح بر یکدیگر', دوفصلنامه حقوق بشر, 08(1), pp. 85-122. طلایی, فرهاد, پورسعید, فرزانه. بررسی تأثیر متقابل حقوق بشر و صلح بر یکدیگر. دوفصلنامه حقوق بشر, 1392; 08(1): 85-122. این مقاله به بررسی تأثیر متقابل حقوق بشر و صلح بر یکدیگر می‌پردازد. تجربه تاریخی جوامع بشری نشان داده است که صلح و حقوق بشر ارتباط تنگاتنگ با یکدیگر داشته‌اند. چنین تجربه‌ای در دوران معاصر به گونه‌ای رشد و توسعه یافته است که ملت‌ها و دولت‌های جهان به این باور رسیده‌اند که حقوق بشر و صلح لازم و ملزوم یکدیگر هستند؛ به گونه‌ا‌ی که نمی‌توان بدون رعایت حقوق بشر به صلح واقعی و پایدار دست یافت؛ و بدون وجود صلح نیز نمی‌توان انتظار داشت که حقوق بشر به طور کامل مورد احترام و رعایت قرار گیرد. از سویی دیگر در دوران معاصر این ارتباط به گونه‌ای رشد و توسعه نموده است که برخورداری از صلح خود به عنوان یکی از نمونه‌های برجسته نسل سوم حقوق بشر مطرح بوده و حق برخورداری از صلح به عنوان یکی از حقوق بنیادین بشر مطرح شده است؛ به گونه‌ای که تحقق عملی دیگر حقوق بشر وابسته به وجود آن در نظر گرفته می‌شود. به بیانی دیگر حق برخورداری از صلح اساس دیگر حقوق بشر را تشکیل می‌دهد؛ چرا که بدون تحقق حق برخورداری از صلح امکان اجرای نسل اول حقوق بشر (حقوق مدنی و سیاسی) و نسل دوم حقوق بشر(حقوق اقتصادی، اجتماعی و فرهنگی) و حتی نسل سوم حقوق بشر (حقوقی همچون حق توسعه و حق برخورداری از محیط زیست شایسته) وجود ندارد. در این راستا است که این مقاله با بررسی اسناد بین‌المللی همچون منشور سازمان ملل متحد، اعلامیه جهانی حقوق بشر، میثاق‌های بین‌المللی سازمان ملل متحد راجع به حقوق بشر، قطعنامه‌های مربوطه مجمع عمومی سازمان ملل متحد (به ویژه اعلامیه حق مردمان در برخورداری از صلح - قطعنامه 11/39 مورخ 12 نوامبر 1984 میلادی، و قطعنامه ترویج صلح به عنوان یک الزام اساسی برای برخورداری کامل همگان از تمامی حقوق بشر - قطعنامه 163/62 مورخ 18 دسامبر 2007میلادی)، و قطعنامه‌های مربوطه کمیسیون حقوق بشر و شورای حقوق بشر نشان می‌دهد که چگونه حقوق بشر و صلح به عنوان مفاهیمی وابسته به یکدیگر در نظر گرفته شده‌اند به گونه‌ای که تحقق یکی، بدون دیگری به طور کامل امکان‌پذیر نمی‌باشد. در نهایت این مقاله نتیجه می‌گیرد که احترام به حقوق بشر و رعایت کامل این حقوق بدون صلح امکان‌پذیر نمی‌باشد و دستیابی به صلح پایدار و واقعی نیز بدون احترام به حقوق بشر و رعایت کامل این حقوق امکان‌پذیر نمی‌باشد. بر این اساس همه ملت‌ها و دولت‌ها باید کوشش نمایند تا از طریق احترام بیشتر به حقوق بشر در جهت تأمین و تقویت صلح در جهان بکوشند و با خودداری از اقداماتی که صلح و امنیت بین‌المللی را به خطر می‌اندازند نقش خود را در جهت تحقق کامل حقوق بشر در سطح جهان ایفاء نمایند. بدیهی است در جهانی که دولت‌ها در صلح و آرامش با یکدیگر به سر می‌برند، حقوق بشر پویاتر و مؤثرتر مورد احترام و رعایت قرار خواهد گرفت و در چنین جامعه جهانی است که منافع همه ملت‌ها تأمین و تضمین خواهند شد. This paper studies how human rights and peace affect each other. The historical experiences of human societies have indicated that peace and human rights have had close connections to each other. These experiences have developed in the modern times so that nations and states are in the view that human rights and peace are complementary. Accordingly, achieving real and sustainable peace is impossible without respecting human rights and it cannot expect that human rights are fully respected if there is no peace. This interrelation has developed nowadays in a way that today the right to peace has become one of the examples of the third generation of human rights and a fundamental human right. This means that it is not possible to realise other human rights without realising such a right. In other words, the right to peace constitutes the basis of other human rights. This is because the first generation of human rights (that is civil and political rights) and the second generation of human rights (that is economic, social and cultural rights) and even the third generation of human rights (such as the right to development and the right to a healthy environment) cannot be realised if the right to peace is not respected. It is in this context that this paper examines such documents as the Charter of the United Nations (UN), The Universal Declaration of Human Rights, the UN Covenants on Human Rights, related resolutions of the UN general Assembly (in particular Declaration on the Rights ofPeople to Peace – Resolution 39/11, 12 November 1984, and Resolution on Promotion of Peace as a Vital Requirement for the Full Enjoyment of All Human Rights by All –Resolution 62/163, 18 December 2007) and resolutions of the UN Human Rights Commission and of the UN Human Rights Council in order to demonstrate how human rights and peace have been considered as dependent on each other so that the existence of one depends on the existence of the other. Finally, this paper concludes that full respect of human rights is not possible without peace and it is impossible to achieve sustainable and real peace in the world without fully respecting human rights. Accordingly, nations and states should make their best efforts to strengthen peace in the world through respecting human rights and to pave the way for realisation of human rights in the world by maintaining international peace and security. It is certain that human rights can be respected more effectively when states are in peace with each other. It is in such universal society that the interests of all nations are guaranteed and safeguarded. “Achievements of the International Year of Peace”, UN General Assembly Resolution A/RES/42/13, 28 October 1987. “Alternative approaches and ways and means within the United Nations system for improving the effective enjoyment of human rights and fundamental freedoms”, UN General Assembly Resolution 32/130, 16 December 1977. “Culture of Peace”, UN General Assembly Resolution 51/101, 12 December 1996. “Declaration (and Programme of Action on a Culture of Peace)”, UN General Assembly Resolution A/RES/53/243, 13 September 1999. “Declaration on the Preparation of Societies for Life in Peace”, UN General Assembly Resolution 33/73, 15 December 1978. “Declaration on Principles of International Law concerning Friendly Relations and Co-operation among States in accordance with the Charter of the United Nations”, UN General Assembly Resolution 2625 (XXV), Annex, 24 October 1970. 25 UN GAOR, Supp. (no. 28), U. N. Doc A/5217 at 121 (1970). "Declaration on the Right of Peoples to Peace", UNGA Resolution 39/11, 12 November 1984. Draft Principles On Human Rights And The Environment, E/CN. 4/Sub. 2/1994/9, Annex I (1994). Forsythe, David P. , Human Rights and Peace: International and National dimensions, University of Nebraska Press, Lincoln, 1993.
http://www. routledge-ny. com/enc/human rightss/peace. html. “Human Rights Council”, UN General Assembly Resolution A/RES/60/51, 16 March 2006. “Implementation of the Declaration on the Preparation of Societies for Life in Peace”, UN General Assembly Resolution 42/91, 7 December 1987. “Indivisibility and interdependence of economic, social, cultural, civil and political rights”, UN General Assembly Resolution A/RES/42/102, 7 December 1987. “Indivisibility and interdependence of economic, social, cultural, civil and political rights”, and UN General Assembly Resolution 43/113, 8 December 1988. “Indivisibility and interdependence of economic, social, cultural, civil and political rights”, UN General Assembly Resolution A/RES/44/130, 15 December 1989. “International Covenant on Economic, Social and Cultural Rights, International Covenant on Civil And Political Rights and Optional Protocol to The International Covenant on Civil and Political Right”, UN General Assembly Resolution 2200 (XXI), 16 December 1966. “International peace and security as an essential condition for the enjoyment of human rights, above all the right to life”, Resolution 1996/14, Sub-Commission on Prevention of Discrimination and Protection of Minorities, 23 August 1996. “International peace and security as an essential condition for the enjoyment of human rights, above all the right to life”, Resolution 1996/16, Sub-Commission on Prevention of Discrimination and Protection of Minorities, 29 August 1996. “International peace and security as an essential condition for the enjoyment of human rights, above all the right to life”, Resolution 1997/36 (U. N. Doc. E/CN. 4?SUB. 2/RES/1997/36), Sub-Commission on Prevention of Discrimination and Protection of Minorities, 28 August 1997.
International Year of Peace (1986) and Proclamation of the International Year of Peace (Annex), UN General Assembly Resolution A/RES/40/3, 24 October 1985. Kirchner, Stefan, “The Human Rights Dimensions of International Peace and Security: Humanitarian Intervention after 9/11”, Journal of Humanitarian Assistance, 25 October 2004, Available at: http://www. jha. ac/articles/a143. pdf. Luraca Declaration on the Right to Peace, SSIHRL (Spanish Society for the Advancement of the International Human Rights Law), Oviedo, Madu Ediciones, 2007. Official Records of the UN General Assembly, 36th Session, Supplement No. 1 (A/36/1), Section VIII. .
Official Records of the UN General Assembly, 36th Session, Supplement No. 6 (A/33/6/Rev. 1), Vol. I, Ch. 9. Programme of the International Year of Peace, UN General Assembly Resolution A/RES/40/10, 11 November 1985. "Promotion of Peace as a Vital Requirement for Full Enjoyment of All Human Rights by All", UNGA Resolution 62/163, 18 December 2007. “Promotion of the right of peoples to peace”, UN Commission on Human Rights Resolution 2001/69, 25 April 2001. “Promotion of the right of peoples to peace”, UN Commission on Human Rights Resolution 2002/71, 25 April 2002. “Promotion of the right of peoples to peace”, UN Commission on Human Rights Resolution 2003/61, 25 April 2003. “Promotion on the right of peoples to peace”, Human Rights Council Resolution 8/9, 12 June 2008. “Right of peoples to peace”, UN General Assembly Resolution A/RES/40/11, 11 November 1985. “Right of peoples to peace”, UN General Assembly Resolution A/RES/41/10, 24 October 1986, and “Right of peoples to peace”, UN General Assembly Resolution A/RES/43/22, 11 November 1988. Rebteln, Dundes, International Human Rights: Universalism Versus Relativism, 1st ed. , Sage, Newbury Park, 1990. Report of the Director-General on the Results of the International Consultations of Governmental Experts on the Human Right to Peace, 154th Session, Executive Board, UNESCO, Paris, 154 EX/40, 17 April 1998. Report of the Director-General on The Right to Peace, UNESCO’s General Conference, 29th Session, Paris, 1997, 29 C/59, 29 October 1997. Roche, Douglas, The Human Right to Peace, Novalis, Toronto, 2003. Teson, Fernando R. , International Huamn Rights and Cultural Relativism, Virginia Journal of International Law 25, 1985. The Advisory Opinion of the International Court of Justice of 8 July 1996 on Legality of the Threat or Use of Nuclear Weapons. The African Charter on Human and Peoples’ Rights, 17 June 1981. The Charter of the United Nations, 26 June 1945. The Constitution of the International Labour Organization (1919). The Constitution of the United Nations Educational, Scientific, and Cultural Organisation (UNESCO), signed on 16 November 1945, came into force on 4 November 1946. The Covenant of the League of Nations, 28 June 1919. The Declaration of Fundamental Principles concerning the Contribution of the Mass Media to Strengthening Peace and International Understanding, to Promotion of Human Rights (1978). The European Convention for the Protection of Human Rights and Fundamental Freedoms, Rome, 4 November 1950. The Kishinev Declaration for the Culture of Peace and Dialogue of Civilizations, International forum for a Culture of Peace and Dialogue of Civilizations, 16-18 May 1998, Kishinev, Republic of Moldova. The Las Palmas Statement, Report of the Director-General on The Right to Peace, UNESCO’s General Conference, 29th Session, Paris,1997, 29 C/59, 29 October 1997, Annex I. “The Oslo Draft Declaration on the Human Rights to Peace”, Report of the Director-General on The Right to Peace, UNESCO’s General Conference, 29th Session, Paris, 1997, 29 C/59, 29 October 1997. Annex II. The Proclamation of Tehran, Human Rights (13 May 1968) – A Compilation of International Instruments , UN Publication, Sales No. E. 78. XIV. 2, pp. 18 et seq. The Recommendation concerning Education for International Understanding, Co-operation and Peace and Education relating to Human Rights and Fundamental Freedoms (1974). “The Right to Peace”, Canadian Senator Douglas Roche Speech, International Conference on Universal Rights and Human Values, a Blueprint for Peace, Justice and Freedom”, Edmonton, Alberta, Canada, 26-28 November 1998. Available at: http://www. peace. ca/senatorroce. htm. . The Rio Declaration on Environment and Development, 124 June 1992. The Universal Declaration of Human Rights (International Bill of Human Rights), UN General Assembly Resolution A/RES/3/217 A, U. N. Doc. A/811, 10 December 1948. The Vienna Declaration (and Programme of Action), World Conference on Human Rights, Vienna 14-25 June 1993, U. N. Doc. A/CONF. 152/24 (Part I) at 20 (1993). “United Nations Decade for Human Rights Education: Towards a Culture of Peace”, UN General Assembly Resolution 50/173, 22 December 1995. "United Nations Millennium Declaration", UN General Assembly Resolution A/RES/55/2, 8 September 2000. (G. A. Res. 55/2, U. N. GAOR, 55th Sess. , Supp. No. 49, at 4, U. N. Doc. A/55/49 (2000)). UN Human Rights Commission Resolution 5 (XXXII), 27 February 1976. UN Security Council Resolution 1244, 10 June 1999. Also See UN Security Council Resolutions 1199 (23 September 1998), and 1203 (24 October 1998). UN Security Council Resolution 1315 (2000), and UN Security Council Resolution 1078 (1996). “We do not want freedom without bread, nor do we want bread without freedom. ” Human Rights vs. Exploitation, http://sfr-21. org/humanrights. html. "Women, Human Rights and Peace", http://www. pdhre. org/rights/women_and_conflict. html.